The Antique Velvet Hat is made out of a remarkable fabric that showcases the soft and smooth texture of velvet without its typical reflective sheen, resulting in a lavish yet refined look fit for a Renaissance or Victorian noblewoman. An ostrich feather and a round rhinestone adorn the top of the puffed cap, and a ribbon detail decorates the edges of its slightly floppy brim. 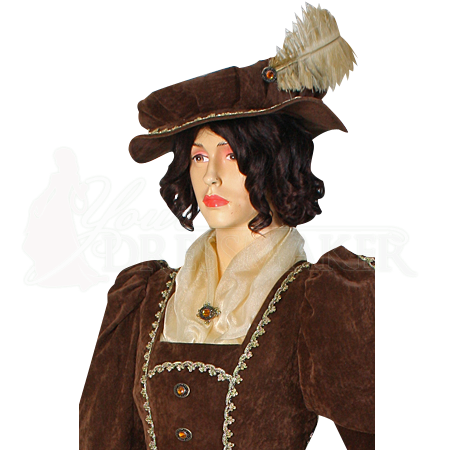 Available in a variety of colors easy to match with a wide range of outfits and styles, this historic reenactment hat is a fantastic way to add detail to any womens period looks.